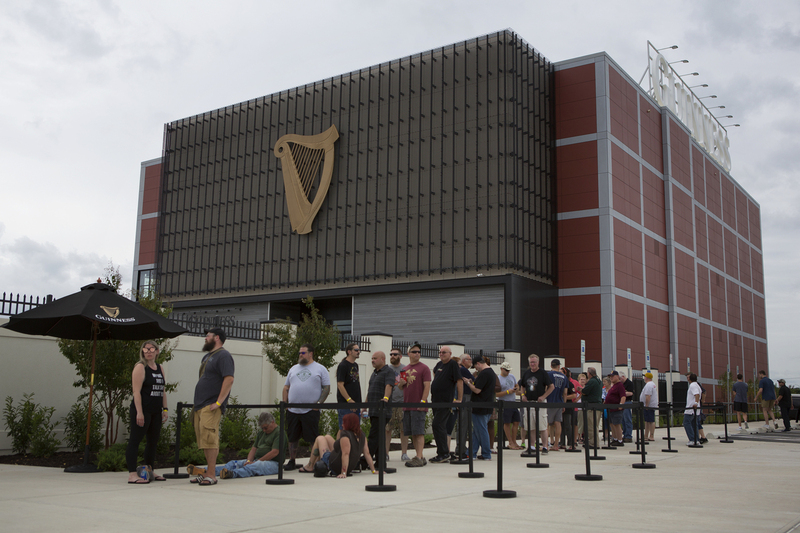 Guinness Opens Its First U.S. Brewery In 64 Years Guinness spent $90 million on the Open Gate Brewery near Baltimore, Md., where it hopes to draw hundreds of thousands of visitors each year. 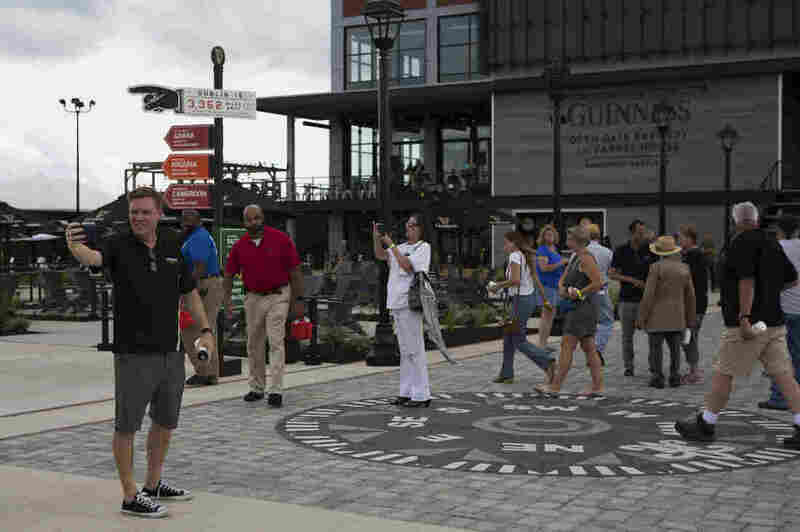 Visitors wait in line on the opening day of the new Guinness brewery in Halethorpe, Md. It's the first time Guinness has had a brewery in the U.S. in more than 60 years. Guinness is famous for making stout beer – and this week, the Irish company opened a new brewery in Maryland. It's the first time Guinness has had a brewery in the U.S. in more than 60 years. So: Does Guinness want to sell more stout to Americans? This time, it turns out, the brewer is trying something different. First things first: Guinness will NOT be brewing its famous stout in America. To find out why, I asked Peter Simpson, the head brewer at the Open Gate Brewery in Dublin. "I think Guinness stout is such an iconic stout, it has such strong links back to Dublin and back to Ireland, that it would feel wrong to take it away from Ireland and to brew it over here," Simpson said in the new U.S. brewery. "So it is always going to still be brewed back in Dublin." As for the beers the Maryland brewery will make, most of it will be blonde lager – a beer that Guinness hopes will flourish in the U.S.
Guinness and its parent company, Diageo, spent $90 million to convert a large distillery into the Open Gate Brewery and Barrel House. The company's hoping to attract 300,000 visitors a year. 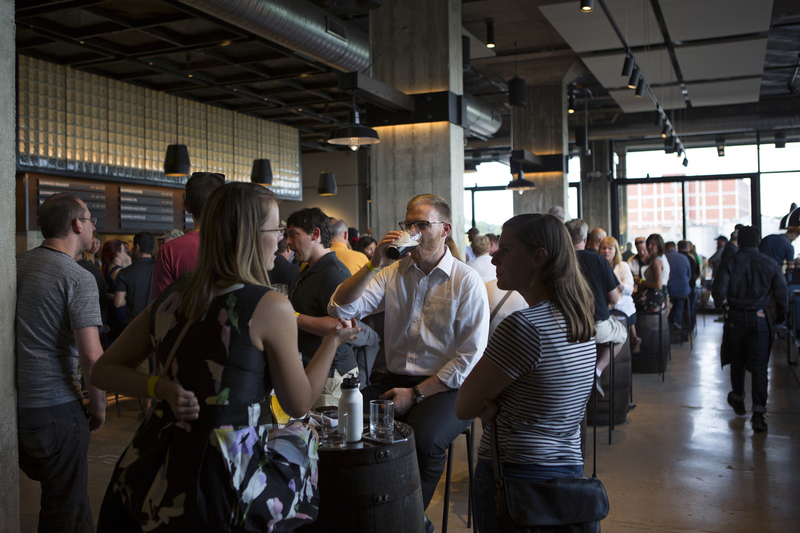 The first barrel of beer was tapped this week — and visitors were let inside, to check out the place. It opened to the general public on Aug. 3 – more than 200 years after the first barrels of Guinness stout were delivered to America's shores, back in 1817. Clara Bannigan (left), Ryan Keehan and Caitlin Zohdi visit the brewery's taproom. Guinness used to have a U.S. brewery — but it closed in 1954 when there wasn't enough demand for stout. Guinness used to have a U.S. brewery — but it closed in 1954. The company had bet that Americans who served in Europe in World War II had developed a taste for stout. But there wasn't enough demand, because drinkers here wanted something lighter, and crisper. "At that time, America was so firmly a lager-drinking country," says Theresa McCulla — who has one of the coolest titles in America: she's the beer historian at the Smithsonian's National Museum of American History. Or, to be more formal, she's the historian of the American Brewing History Initiative. McCulla says that early on, Americans drank all kinds of beers, including ales and porters. But after German immigrants arrived in the mid-1800s, the U.S. fell in love with lagers. (Left) Bartender Michael Storm takes an empty beer glass from a customer. The taproom serves 16 different Guinness beers. (Right) Toucans hang from the ceiling at the new Guinness brewery. The birds appear in many old beer advertisements throughout the building. Those German immigrants "used a different kind of yeast that sat on the bottom of fermentation vessels, they brewed under cooler conditions. It produced a beer that was very effervescent and refreshingly light," she said. "And Americans were really entranced." That was true when Guinness came over in the 1950s – and it's still largely true today. Guinness is coming back to the States at an interesting time. Americans aren't as thirsty for beer these days. Even the growth of craft beer has slowed down. And with more than 6,000 breweries, beer companies have to do more to win customers. Deanna Tiek (left), Plamen Nikolov and Nguyen Nguyen came from Washington, D.C., to sample beers at the brewery's opening day. Outside, there's space for food trucks. Inside, there's a taproom where Guinness stout from Ireland is poured next to beers from the experimental brewery downstairs. To run it all, Guinness has hired experienced brewers from respected craft beer companies, like Stone Brewing, Jolly Pumpkin and Highland Brewing. 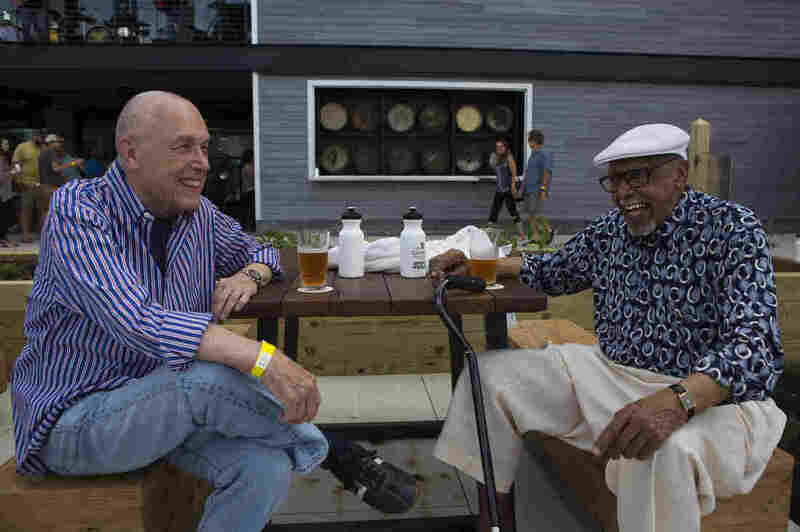 Located about 10 miles from downtown Baltimore and 30 miles northeast of Washington, the Open Gate Brewery is tucked alongside an interstate, in an area that is by turns rural and industrial. If it's a success, the Guinness brewery is sure to make ripples in Maryland's growing beer scene. 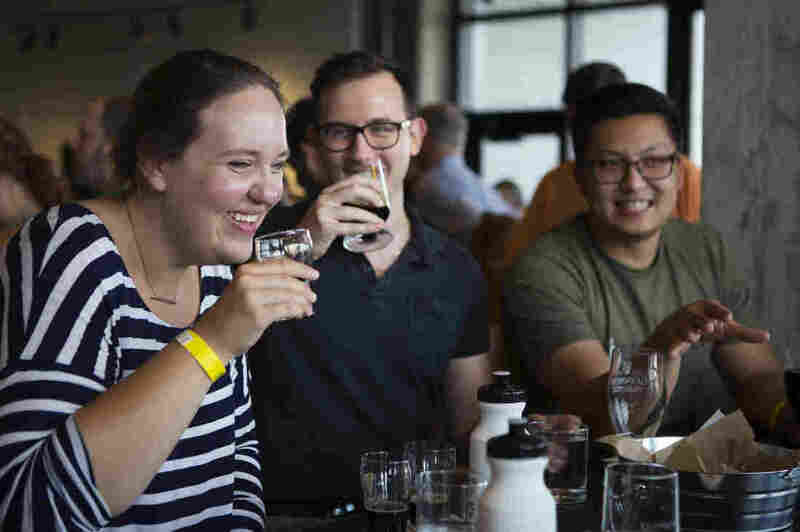 At the opening ceremony, Brewers Association of Maryland President Cindy Mullikin, who co-owns and manages Mully's Brewery with her husband, suggested the new (old) kid on the block already is raising the state's profile as a beer destination. "The amazing and pretty unique aspect about the brewing industry is our philosophy that the rising tide raises all ships," Mulligan said. "We welcome the brewing infrastructure and amazing talent that Guinness brings to Maryland's vibrant beer industry. We're looking forward to many collaboration and innovative brews to come." Maryland's Governor Larry Hogan cut a ceremonial ribbon to open the new brewhouse. "I'm a strong advocate for new businesses, and as you can probably guess, as an Irishman — and maybe looking at the girth — I have enjoyed a few pints of Guinness in my time," he said. Hogan says he supports Guinness --- one beer at a time. The folks at Diageo are hoping other Americans will follow suit. An earlier Web version of this story incorrectly referred to Cindy Mullikin as Cindy Mulligan and incorrectly said her family runs Mully's Brewery. She co-owns and manages the brewery with her husband.